Candy and valentines for kids are standard, but you can easily whip up a Valentine's Day breakfast for your youngsters that put those sugary sweets to shame with a few simple tricks! From heart-shaped cinnamon rolls to Valentine's Day cake batter pancakes, kick off the morning with these four Valentine's Day breakfast ideas for kids. Lure your kiddos out of bed with the sweet smell of cinnamon rolls, but with a Valentine's Day breakfast twist! Remove the refrigerated cinnamon roll dough from the canister and unroll. Set the icing aside. Take one end of the dough rope in each hand and start tucking and rolling it in towards each other until they meet in the middle. Pinch the unrolled bottom portion of the dough to form the point of the heart. Bake according to the package directions and top with icing when completely baked but still warm and serve! 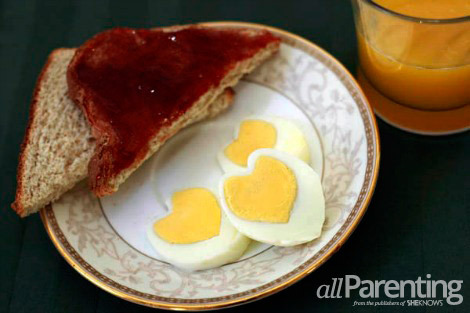 When you whip up breakfast on Valentine's Day for your kids, boring old eggs won't do. With a little preparation originally inspired by www.annathered.com, you can create a unique morning meal that will tickle your youngsters pink! Peel warm hardboiled eggs completely and discard shell. Cut your paper plate double the width as the height of your egg. Bend lengthwise. 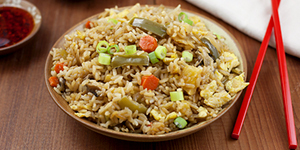 Place the hardboiled egg in the middle of the plate and press chopstick gently down the center of the top of the egg. Wrap rubber bands around each end of the chopstick and paper plate to create the top crease of your heart down the middle of your egg. Place in fridge for at least 10 minutes. Remove egg from your contraption, slice and serve heart-shaped eggs to launch a chorus of ooohs and aaaahhs! Even those youngsters who usually resist the healthy stuff, will gobble up these heart-shaped fruits faster than you can say Cupid! Slice the fruit wide enough to accommodate your cookie cutter. 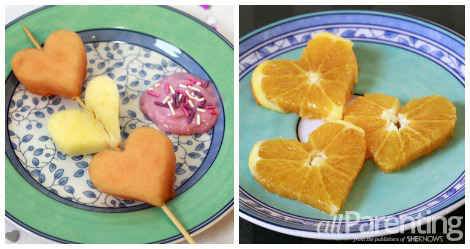 Using your cookie cutter, slice Valentine's breakfast-worthy shapes from your fruit slices. Alternate heart-shaped slices of fruit on the skewer and serve! You can even pair with yogurt and Valentine's Day sprinkles for kiddos who need a little extra coaxing. Using allParenting's cake batter pancakes recipe and some Valentine's Day sprinkles, you can turn your kids' Valentine's breakfast into a meal worth waking up for! 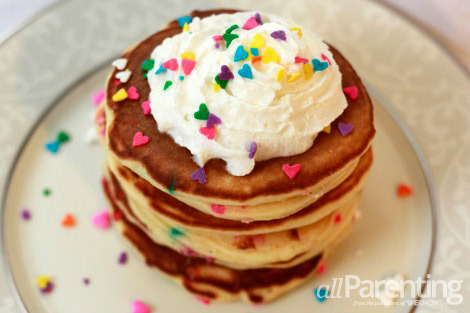 Follow the directions in the cake batter pancakes recipe, substituting birthday sprinkles with heart-shaped sprinkles. When mixing the glaze, add one drop of the red food coloring to the mix to blend up a pink-tinged nod to Valentine's Day. Top with whipped cream, more Valentine's Day sprinkles and serve!